The Freeway T80 recliner is a shower chair, a toilet chair and a commode chair all in one. When in a vertical position, it fits over a standard toilet. 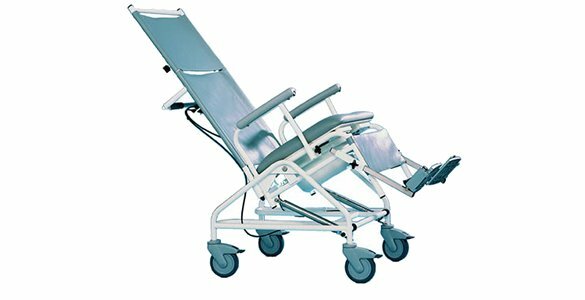 The carer has then the facility to recline the chair in an infinite number of positions up to 45 degrees, whilst maintaining a safe and comfortable seating position for showering and commoding. The reclining facility gives considerable extra comfort to the user and changing positions offers some pressure relief. The recliner is simple to operate via a squeeze brake lever on the cross bar push handle. The two stainless steel gas springs and the recliner’s superb balance, make it light and easy to use. It has a safe working load of 25 stone (160kgs). The recliner gets its movement from two powerful, highest quality gas springs. By using two gas springs rather than the usual one, the chair has free access over a toilet and yet is engineeringly correctly balanced, and therefore stable and strong. The chair can be reclined using the easy to use handgrip in an infinite number of positions until the chair reaches 45 degrees. The chair is then simply raised by gentle pressure after releasing the gas strut.